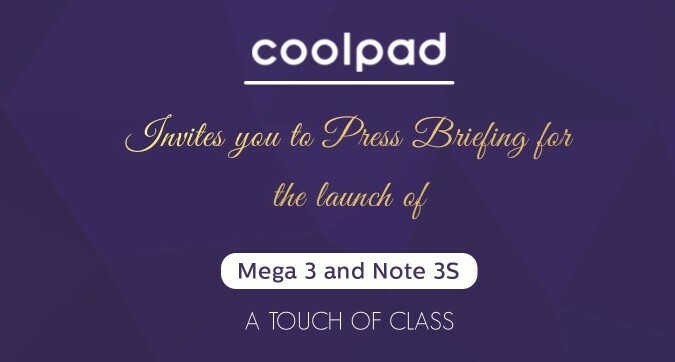 Coolpad is all set to unveil its Mega 3 and Note 3S smartphones on November 30, 2016. The former is the successor of the Coolpad Mega 2.5D while the later will be Coolpad Note 3 family. It is the upcoming Coolpad Mega 3, whose specification has just been disclosed in Amazon.in. According to the leaked spec sheet, the smartphone may come with triple SIM card slots with all of them being 4G VoLTE enabled. Only a few days ago, Coolpad sent out an official invitation for it November 30 launch event. We even got to see the record of the Coolpad Mega 3 being imported to India. Now, here comes the full specification of the forthcoming Android device. The Mega 3 is expected to be budget handset while the Note 3S will be a mid-ranger. Some reports suggested that as LeEco and Coolpad have joined their hands, there may be a new Cool branded phones, but it seems that it will not happen right now in our country. As stated in the listing, the Coolpad Mega 3 will sport a 5.5-inch HD (1280 x 720) display. It is still not known if this too will rock the 2.5D curved screen of the Mega 2.5D. Powering this up will be a brand new MediaTek MT6737 SoC. The quad-core processor features four ARM Cortex A53 CPU running at 1.25 GHz each. This will be mated with a dual core ARM Mali T720 GPU clocked at 550 MHz. Speaking of memory, the Coolpad Mega 3 may come with 2 GB of RAM combined with 16 GB of onboard storage. You will also be able to slide in a micro SD card to further ramp up the memory. The upcoming smartphone shall run Android 6.0.1 Marshmallow. The company might promise to an Android 7.0 Nougat update. Connectivity-wise, the handset will sport three 4G V0LTE-supported SIM card slots. The usual Bluetooth, Wi-Fi, GPS, FM Radio, eCompass, shall be present along with a fingerprint scanner. Coming to the camera, the Mega 3 will get an 8 MP rear camera as well an 8 MP selfie snapper. A 3050mAh non-removable lithium-polymer battery is expected to juice up the device. Coolpad has not yet announced anything about the pricing and availability of the Mega 3. Considering that the Mega 2.5 costs Rs. 6,999, we presume that its successor might be priced between the Rs. 7,000 to Rs. 8,000 mark. Talking about availability, the Coolpad Mega 3 may be available for purchase soon after its launch on 30th November.